Extreme Wide Angle Lens Correction- Warp Tool Style! A wide angle lens is nice to have in your kit. An extreme wide angle lens like Canons EF 17-40mm is even better. You can get just about everything in the landscape in front of you with just one shot! It also adds some nice drama to a landscape by bending the reality a bit. The problem with an extreme wide angle lens is what it does to objects and building that reside on the edges of the frame. It can take a straight structure and bend the verticals almost 35 degrees. I was shooting this barn the other day and noticed just how bad the distortion was at such an extreme wide angle. I tried using many techniques to fix the distortion. 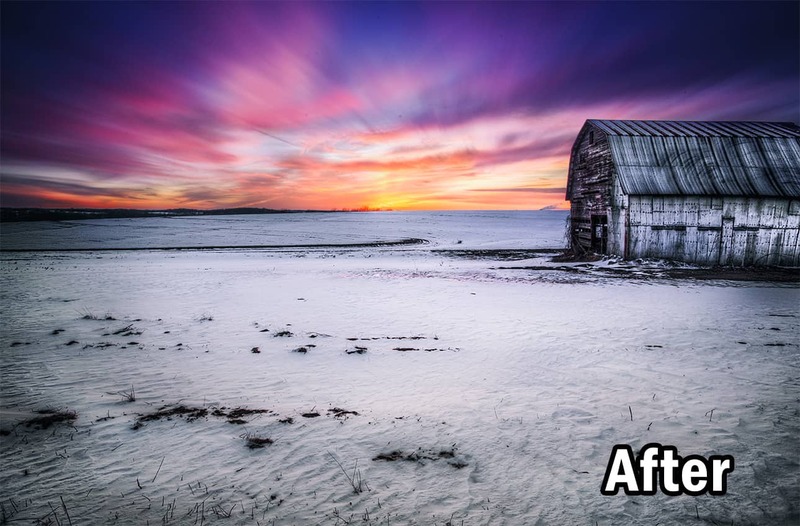 I started with ACR, when I fixed it in the lens section it warped the entire picture, not just the barn. The next idea was to use the Lens Correction Filter. That was similar to ACR, but made some other changes that I did not like. You see anytime you try to correct the distortion with something quick like the lens correction filter, it will change the look of the entire photo. It takes away from the magic that occurs with the use of a Wide Angle lens and almost makes shooting with one almost pointless. That is when I discovered the power of the Warp Tool for lens correction! In this tutorial I will show you two ways the Warp Tool can be used to correct wide angle lens distortion. Good stuff! Never tried to isolate the warped part like that. That will help!